What is ScoopFree Original Self-Cleaning Cat Litter Box? The ScoopFree Original Self-Cleaning Cat Litter Box allows for hands-off litter box cleaning! It comes with a pre-filled litter tray and contains premium blue crystals with unbeatable odor control. Unsightly waste is raked into a covered tray at the end of the box 20 minutes after your cat leaves the litter box, and the plastic lining creates a barrier from leakage. The best part is, the ScoopFree Original Self-Cleaning Cat Litter Box has been tested rigorously for more that 100,000 cycles without failure or jamming. So whether you are away for couple days or a couple weeks, your cat sitter no longer has to worry about changing the kitty litter. NOTE: ScoopFree Original Self-Cleaning Cat Litter Box Tray Refills are also available, sold separately. The ScoopFree Original Self-Cleaning Cat Litter Box is an innovative, convenient litter box that allows you to leave without cleaning with your hands for weeks at a time. 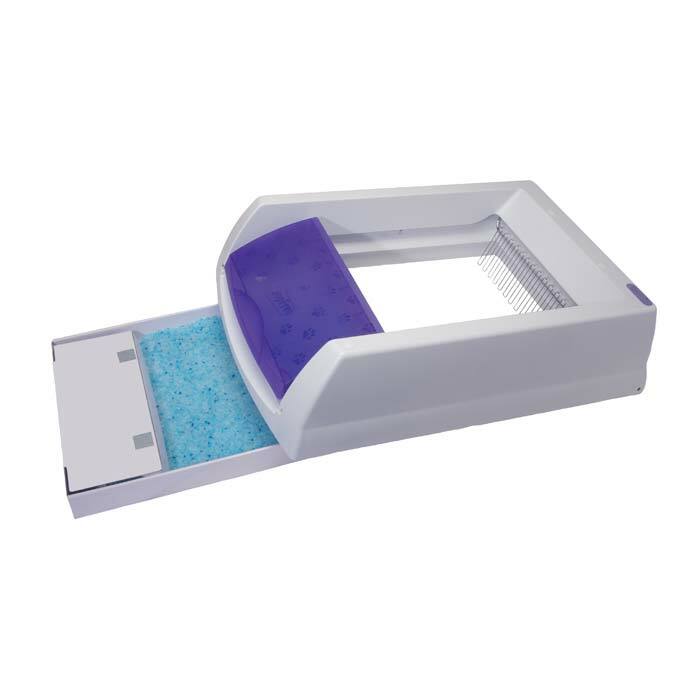 Filled with odor absorbent blue crystals with unbeatable odor control, the ScoopFree Original Self-Cleaning Cat Litter Box comes with a disposable litter tray that contains a plastic lining that creates a barrier to help protect against leakage. Twenty minutes after your cat has used the ScoopFree Original Self-Cleaning Cat Litter Box, it cleans itself using an automatic rake that picks up waste and places it in a covered waste trap - so you don't have to see or smell waste. All you have to do, it make sure you plug it in! Do not use with cats that have problems using litter boxes. Do not let small children play with or near the litter box. If you are pregnant or have an immune deficiency, do not touch cat waste, soiled litter, or used litter trays at any time. Do not immerse in water. Periodically make sure the indicator light is green and litter is clean. Do not add litter to box or tray. Set up is easy. Simply place near an electrical outlet and lift the litter box and slide in the disposable litter tray filled with Premium Blue Crystals. Once your cat uses the litter box, the crystals immediately absorb the odor and begin to dehydrate solids. 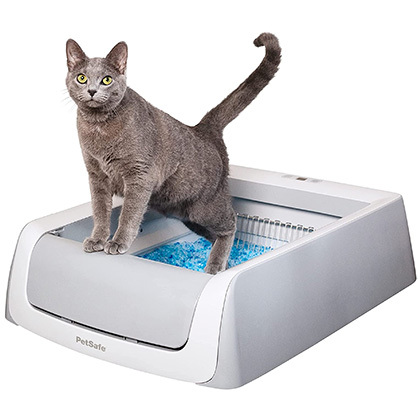 The sensors inside the ScoopFree Original Self-Cleaning Cat Litter Box detects when your cat uses the litter box. Then, 20 minutes after your cat uses the litter box, the rake automatically sweeps the waste into a covered waste trap and leaves the little box clean and fresh. After a few weeks, cover the old litter tray and throw it away. Replace with a new tray. 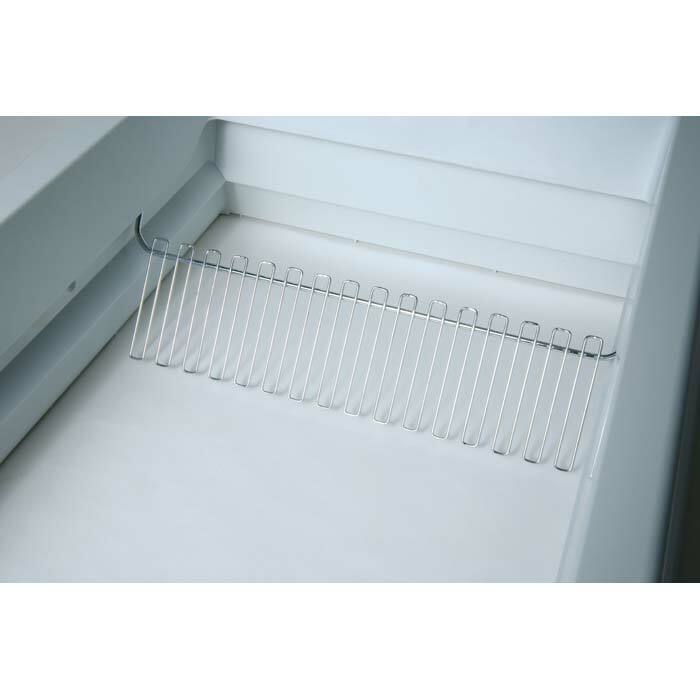 ScoopFree Original Self-Cleaning Cat Litter Box Tray Refills are available, sold separately. Recommended litter tray replacements: At least once every 20-30 days for one cat, every 10-15 days for 2 cats, every 7-10 days for 3 cats. The ScoopFree Original Self-Cleaning Cat Litter Box was designed for use with one or two cats. If you have more than two cats, you will need one litter box for every two cats. Includes UL-rated 120V 60Hz adaptor. Operates on a standard wall outlet.